Our most popular web designs is a bright, bold, more compact arrangement with pink hydrangea, hot pink roses, green trachelium and purple stock. 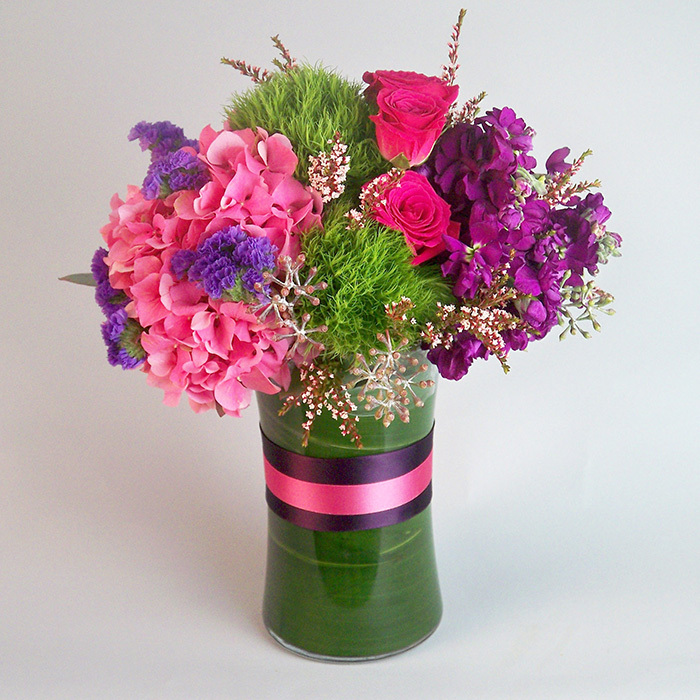 Arranged in an 8″ gathering vase with a purple and hot pink ribbon wrap the French Flair is perfect for any occasion and will look great everywhere in the house or office. 14″ tall and 12″ wide. Better: Going to a wide gathering vase will increase the width, but the height will remain the same. Best: Wider still, this piece makes a bold statement for the foyer or the island in the kitchen.